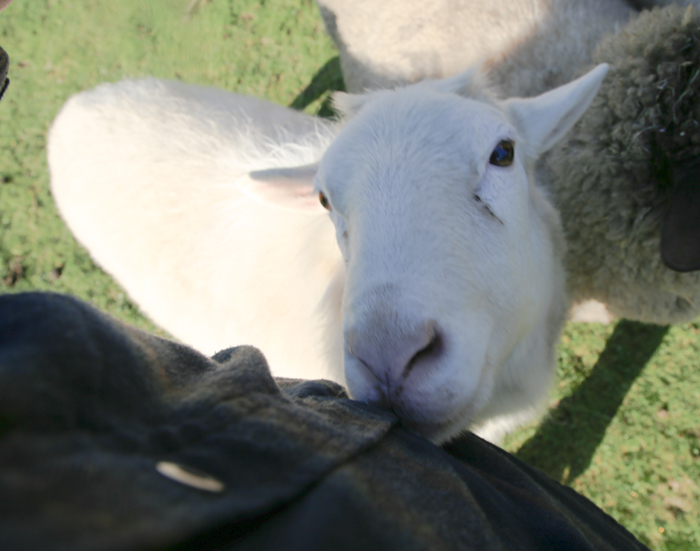 Lambi the ram from Swallow Farm nibbles on a button of a Driftwood photographer’s shirt on Monday. Gulf Islands farmers have been among those urging the CRD to not eliminate compensation to farmers whose sheep are killed by rogue dogs. The Capital Regional District has stepped back from a proposal to eliminate compensation for livestock killed by rogue dogs but will continue to explore the possibility for communities to opt in or out of the arrangement. Last September, the CRD’s board of directors directed staff to bring forward bylaw amendments to eliminate future compensation claims for six participating communities, including the three electoral areas. The board discussed the results at their Jan. 9 meeting, with a staff report firmly recommending amendment of the Dog Regulation and Impounding Bylaw. While Juan de Fuca electoral area director Mike Hicks had championed the change, citing frustration that his electors might pay into claims for other farmers, he withdrew the motion after hearing from farmers in the region. Staff were asked instead to come back with another report on the possibility of segregating the service by community. Hicks later said he supported a service that all CRD member communities would pay into. Salt Spring director Gary Holman said he does not support any kind of loss of compensation for his electoral area. B.C.’s Local Government Act makes it possible for municipalities and regional districts to enact livestock compensation bylaws, but it does not require them to do so, and many other communities have chosen not to. Saturna Island farmer and Inter Island Sheep Breeders Association president Jacques Campbell feels that separating the service would do nothing except add to administration costs. A border collie named Meg from Campbell Farm was the very first dog to gets its licence in the CRD when the bylaw went into effect in 1980. “I have four dogs now and I’ve been paying for it ever since. I consider it my insurance policy,” Campbell said. According to the Jan. 9 staff report, dog licensing fees are inadequate to fund livestock compensation. The report notes the last two claims have been high — $2,043.75 and $4,500, respectively — and there are further costs incurred by the investigation process. There is no specific budget for livestock compensation and no maximum limit to be paid out per year or per claim, although there is an individual limit of 75 per cent of the value of an animal, up to $750. “Since this function was introduced, livestock insurance has become widely available, which often includes coverage for home and contents, farm products and other damage,” the report states. At the same time, the total number of claims made is relatively low, with just 10 in the past 15 years of service. The CRD only pays compensation when livestock deaths can be attributed to dogs and the farmer does not know the dogs or who they belong to. When the dogs can be identified, it’s up to the farmer to seek compensation from the owner. Salt Spring’s Windrush Farm focuses on heritage breeds, raising both heritage turkeys and rare Cotswold sheep. For sheep of that value, the CRD’s $750 maximum would not recompense the real value of the animal, but it would be better than nothing. “I would be very disappointed if the CRD eliminated this compensation because I don’t think there’s a good alternative,” owner Margaret Thomson said. For more on this story, see the Jan. 16, 2019issue of the Gulf Islands Driftwood newspaper, or subscribe online.